What do Fairy circles, Ringworm and Christchurch have in common? Ten years ago, I left New Zealand for the first time, and lived in Denmark for two years. In those two years I lived in three apartments. In the past they would have been separate villages; one was in the village of Trørød (blue), the next was on the outskirts of Lyngby (red), and the third was in Brede (yellow). Over time, a mosaic of separate country villages have expanded together and merged into a whole. In modern times, all three are part of “Storkøbenhavn” (Greater Copenhagen). Christchurch has done the opposite, – it was a city with a very distinct centre, which has effectively splintered into a mosaic of “villages”. Christchurch is no-longer centralised, – it is fragmented, broken apart (and desperately doing it’s best to cling together, in spite of a myriad of stress, threatening to pull apart the fragile strings holding the community of Christchurch together (dare I mention threatened school closures?). The city of Christchurch exists in name only, – in reality it is as dead as Raphus cucullatus ( or,.. if you prefer, Megalapteryx didinus). In the past, droves of workers would set out each morning* for their daily migration into the centralised Christchurch Business District (ie. the CBD) . The CBD has effectively been immolated by the effects of the earthquake, – it is now a jungle of concrete rubble and twisted reinforcing iron, and a savannah of empty spaces where clusters of buildings once stood (and housed colonies of businesses). Below is a map of Christchurch showing the original extent of the CBD redzone (in orange), and the current day extent of the CBD red zone ( in red), in the bottom right of the map. In the past there was considerable traffic flow each week day morning down Papanui road, and I specifically remember that early morning traffic jams down Harper Ave were extremely common. *The reverse migration in the late afternoon/evening, did of course also occur, but it is the morning migration that this study is specifically concerned with. In the alternate universe we now find ourselves in, where the centre of Christchurch no longer exists, the daily migrations still occur, but the paths of those migrations have changed. There is no longer one centralised destination, thus traffic flows have changed to multiple destination hubs. As well as the long term alteration to migratory paths, there are short term ones as well, – due to a phenomenon known as “earthquake repair road works”. According to a recent “Environment Canterbury” metroinfo consultation document, there has been significant impacts on the pattern of bus usage (ie. there is no longer a centralised flow of bus usage) , which is necessitating a serious rethink on what bus routes should be offered, – ie buses connecting between suburban hubs, rather than to and from the central city. Overall, bus usage has decreased and presumably car usage has correspondingly increased. Each weekday morning I take my son to preschool between 8.15 and 8.30, and travel a short distance between “Northlands” and “Bryndwr”/”Strowan” (shown by the pink line in the map below). During this journey, I travel on the first part of Papanui road, and for the last month or so there have been extensive roadworks further up Papanui road. These roadworks are situated around where Papanui road intersects with Innes Road and Heaton street. When the road works were first erected, there was a sign suggesting that people might like to take a detour away from the intersection, with Blighs road being one potential temporary traffic flow detour. I live close to Northlands (indicated by the top pink marker in the map above), and the start of the roadworks can be seen in the bottom right of the above map. Consequently, I began to wonder – what impact are the roadworks having on traffic flow down Papanui road? (which was formerly a major migration route to the CBD), and what impact is there on the side roads that might be used as detours? … Thus the topic for my Massey University biostatistics traffic survey was conceived. The effects of the Christchurch Earthquakes on morning Traffic flow in the “villages” of Papanui, Bryndwr, and Merivale (aka. North West “Christchurch”), with focus on impact of the temporary roadworks at the intersections of Papanui road & Heaton street/Innes road. I initially chose to do a study that aimed to quantify the impacts of the Papanui road & Heaton/Innes road intersection roadworks, on traffic flow down “Blighs road”. Specifically, is Blighs Road being used as a detour to avoid the roadworks intersection? Because this question can not be directly answered with the data I was able to collect, I have instead collected baseline data to answer the specific roadworks impact question, and for a broader roadwork impact study, when the roadworks have finished. I have collected traffic measurements from several study sites, in the area northwest of the deceased CBD, extending from Northlands to Harper Ave. This could be considered a “pilot study” data on the broader question of whether peak morning traffic flows in North West Christchurch are more decentralised**. *Since I wasn’t sufficiently prescient, – and, sadly, do not have access to the tardis, nor any other kind of time machine – I was unable to collect any data before the roadworks started, and as the roadworks are at the time of writing, still there, I havn’t been able to collect any post roadwork completion traffic flow data. **Again, I lacked both a time machine and prescience to collect traffic flow measurements, before the earthquakes happened, so can’t directly quantify the full extent of post-earthquake traffic flow decentralisation resulting from the destruction of the CBD. Theoretically, if traffic flow was absolutely even, there would be very little variation in the variable “time since last car passed”. It is extremely unlikely that traffic flow would be precisely even, especially on roads where traffic lights are present. It is expected that numerous factors would influence the evenness of traffic flow, – eg. traffic density (ie. how many cars are travelling down that part of the road, distance from a controlled traffic light, number of potential entry points onto that stretch of road, and whether there are any obstacles interrupting traffic flow (such as roadworks). Does traffic density change over time? Is there greater traffic density, going in the direction of the CBD or away from it (and if away, where are the cars going instead. Do roadworks result in lower traffic flow?, do they alter the variability of traffic flow (eg. smooth down the cyclic traffic flows which result from traffic lights? It is expected that numerous factors would influence the evenness of traffic flow, – eg. traffic density, distance from a controlled traffic light, number of potential entry points onto that stretch of road. regular cycle dictated by changing of lights,..v’s random fluctuations, – any alterations caused by roadworks are unlike tly to be cyclic, and when there is low can density, fluctuations are more likely to be random (variable times in which car drivers started their journey)..
For the last month or two, there have been major road works down Papanui road, North of the Heaton street/Innes road intersection. There are also road works on Innes road adjacent to the intersection, and initially road works were also on Heaton street also adjacent to the intersection. During this time, there have been restrictions on traffic flow through the intersection, – for instance, cars are unable to do a right hand turn into Heaton street, from the Northern end of Papanui road. It is highly probable that these roadworks are to repair infrastructure that was damaged as a direct result of ground damage caused by the Earthquakes. Broadly speaking, Northwest Christchurch was the part of the city that experienced the least amount of land damage (including liquefaction). The east side of the city experienced the greatest amount of liquefaction, and by comparison, the north west side had very little liquefaction. The location in the Northwest where I saw the greatest amount of liquefaction was on Papanui road in the vicinity of St Andrews College. I am sure it is no co-incidence that these road works begin where I observed this liquefaction. Four locations were chosen to directly measure traffic flow on each of the four arms of the roads that the roadworks were situated on – Papanui/Weston, “Papanui/Holly”, “Heaton”, and “Innes”. One location “Harper Ave” was selected because it was a location that used to experience peak traffic density from CBD commuter traffic. This site was used primarily as a “control” site to verify whether or not the CBD destruction had in fact altered traffic flow on that former main route to the CBD. Several other locations of interest were identified as possible future sample site locations (these are all marked with “?” on the maps). The data collected was, in simplest terms, a tally of cars passing the vantage point for each sampling location, from both sides of the road. A record of the time each car passes was made (relative to the session start time). The time records of each passing car create two continuous numeric dependant variables – time the car passed relative to start time, and time the car passed relative to the time since the previous car passed. There are a total of 8 sample locations, creating a categoricalvariable of “Location”. For each sample point there are separate data records for each side of the road, giving an additional nominal categorical variable of “pair id”, which allows us to separate out different directions of traffic flow at each location relative to both the road works, and the former CBD. The variable “pair id” is a nominal variable because it doesn’t measure anything that would impact of any measure of traffic – it merely reflected which stopwatch the data was tallied on – ie. 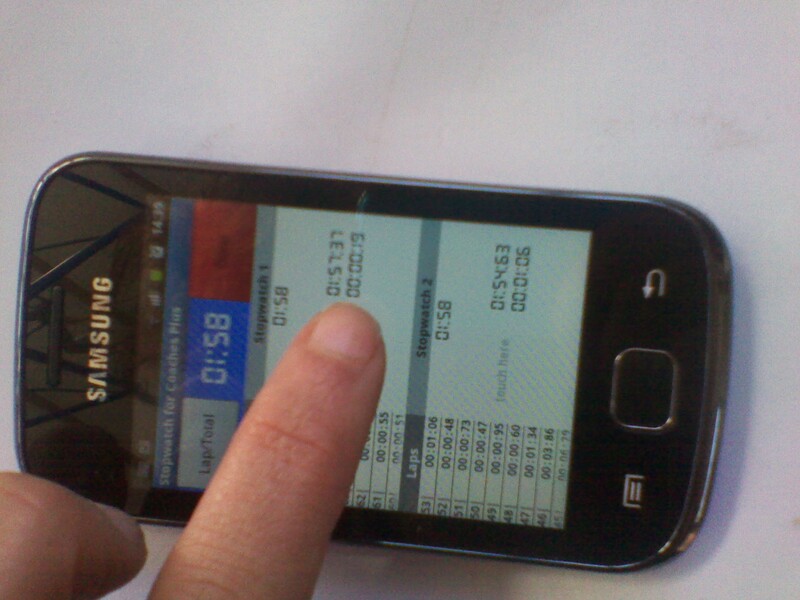 it was useful just for data organisation. This gives a total of 16 samples of traffic flow data, each coded with a different “Identifier” code number. Other ordinal categorical variables recorded were sampling date, Day of the week, and weather, – these were recorded in case the sites were resampled at a future date. At each study site, observations were made for half an hour. Start times of these half hour observation periods varied from 8.45am – to (am. Each measurement was made immediately after I had dropped my son off to preschool. Ideally each sample period would have been made at exactly the same time, but due to the element of chaos inherent with getting little boys to preschool, this wasn’t always possible. During each half hour observation period, the times that cars passed by the observation point (my parked car) were recorded. Separate records were made for each traffic flow direction (ie. each side of the road). The specific time that each car passed the study site vantage point was recorded with the use of the android smartphone app “Stopwatch for Coaches +“. Immediately prior to each sampling period I would open the app, and would select that two stopwatches be used. Below the start/stop buttons at the top of the screen, the stopwatch screen is divided in half – stopwatch 1 on the top half of the screen, and stop watch two on the bottom of the screen. I would orient the phone so the top half was was to the left, and thus stopwatch one was to the left and stopwatch two was to the right. The start button would start both stop watches simultaneously, and each time the phone screen was tapped in the appropriate stopwatch sector of the screen, successive “laptimes” were displayed. At the completion of each sampling time, the stop watch was stopped, and the save button selected. In the app menu I would then select the newly created time record folder, which would contain a separate file for each stop watch. These files would then be renamed (so that I could easily identify which side of the road each file corresponded to. The files would then be saved to the simcard folder and then uploaded to dropbox. When saved, each stopwatch record file contained an electronically recorded time stamp of each time the screen was tapped (and thus each time a car passed the sample site vantage point (ie. where I parked the car). The rationale for use of this data recording method (and the process of arriving at my rationale) can be seen at the foot note #, at the end of this methods section. (yes that did make me feel awesomely tech savvy, and totally special – with the c prononced with a “th”of course…). The text file would then be imported into an excel spreadsheet, and the recorded time stamp would be converted into time in seconds since the start of recording. Another data column was then created which calculated the time between each car. The sample identifier codes reflect the order in which the sites were sampled, and within each site, which stopwatch the data for that side of road was recorded on. Therefore, the ID numbers don’t sort the sites for comparison in a meaningful way. Consequently, the sites are ordered the sites were presented in the “study locations” section above. The sites are also colour coded according to the colour of the google maps markers used to indicate where each study location is located. The most definitive conclusion that I can derive from this scatterplot is that the information is too densely packed, to arrive at any conclusions … – aside from the conclusion that I can’t make any conclusions – (well,.. actually, I sort of from the fact that most cars travel past the sample location within 20 seconds of the previous car tallied)…. yeah,.. er… no,.. really,.. the serious results are below. Broadly speaking, the above summary statistics and data exploration graphs show that at all sites, traffic flow does fluctuate over time, – both in the short term (ie. variation that occurs within a few minutes, and variation that occur over the observation time span. The tabulated averages and the box plot indicate that at some locations, overall traffic flow decreased over the 30 minute observation period, with the reverse occurring at other locations. A mean value of below 15 minutes could indicate there was more traffic flow in the first half of the observation period, and a mean value above 15 minutes could indicate greater traffic flow within the second half of the observation period. Variation as expressed by the SE, appears to be in part inversely related to traffic volume. What else is involved? 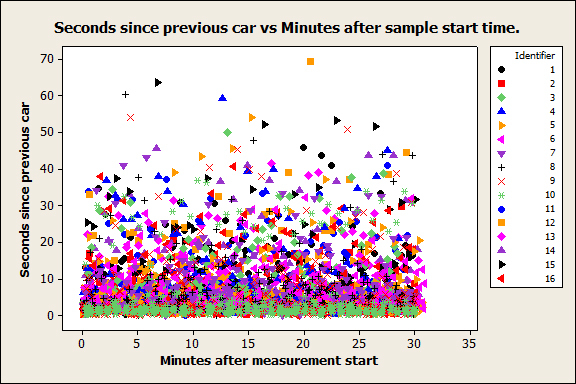 The dot plot above shows that the variation in time interval between cars varies between samples. Of special note is sample 10 (Harper Ave, travelling from the Rossal/Park terrace intersection towards Fendalton Ave) which distinctly shows two clusters of time intervals. Cars usually travelled within 9 seconds of the previous car, with a peak of 3 second intervals,.. as well as a second cluster of intervals between 15 & 38 seconds. I will now examine the results for each sample location in more detail. Histogram Bar widths were calibrated to maximise the display of the cyclic pattern seen at the Harper ave site. From eyeballing the data it seems that there might have been a time interval of about 1.2 minutes. Therefore a “bin” width representing 36 seconds for each histogram bar was selected for all the histograms representing traffic density over time. This assumes that all traffic light intervals are equivalent – an assumption that might be erroneous, – quantifying traffic light change intervals, would be of great value in further interpretation of this data. Traffic coming from the intersection is more irregular (perhaps “traffic light-cyclic”). The traffic coming to the intersection is less variable, and appears to have two cyclic peaks – whether this is real or an artefact of the histogram bar width is uncertain without deeper analysis. It should be highlighted that the side of the road with the greatest traffic volume is the side coming from Merivale – ie. there is more traffic coming from the direction of the former CBD than there is going towards it. This is the complete opposite of what would have been experienced on this road before the Christchurch earthquakes. Holly road is located a 950m away from the intersection, so traffic flow on both sides is relatively even, and doesn’t show the short term irregular cyclic pattern that results from proximity to traffic lights. There is greater traffic on the Northern side of Papanui road (ie. less traffic closer to the former CBD). It is uncertain whether the difference in traffic volume between the two sites is due to real differences in traffic flow or due to different traffic volumes on the different days. The side of Innes road coming from Papanui road/roadworks appears somewhat more cyclic. The volume of traffic is greatest travelling west towards Papanui road (56%). Overall, I am unable unable to assess whether there is any significant impact of the roadworks on traffic volume and/or flow without baseline data. More in depth time series analysis might help. Traffic from Innes to Heaton greater than the reverse, but more traffic travelling west on Innes road than there was travelling in the same direction on Heaton street. It’s not certain whether the diffence in traffic is due to cars turning from Innes road onto Papanui (rather than travelling straight onto Heaton street), or whether it merely reflects differences in traffic flow on the two sampling days. The Harper ave site provided very value traffic flow data for several reasons. Firstly, it was the site which had the highest combined traffic volume. The side coming from the CBD end had the most distinctive cyclic traffic flow pattern, and the second highest sample traffic volume. This was the one sample that which had traffic coming from a stretch of road that had a single entry point that was controlled by a traffic light. From eyeballing the data, it seems that there was an influx of traffic approximately every 1.2 minutes. The dot plot of time interval frequency data indicates that there are two clusters, which would correspond to a influx of traffic after the lights have changed to green, and then a lull in traffic when the traffic lights are red. Additional analyses would have to be done to verify whether this observation is accurate. An important point to note, is that he side of the road with the greatest amount of traffic was from the side travelling AWAY from the former CBD area. In addition, although traffic flows were quite high, there was a complete absence of traffic jams on this stretch of road that used to experience daily traffic jams, during peak early morning commuter traffic time. There are two things of note at this site – the overall traffic flow trend, and that , the papanui road side shows a strong cyclic nature (though weaker than that at Harper ave). On the side of the road which includes traffic from the school , there is a peak of traffic mid-way in the first half of the sampling time (as mentioned above), whereas, conversely, there is a peak of traffic from the Papanui side of the road midway in the latter half of the sampling period. As there is no baseline data, I am unable to assess the impact of the Papanui road roadworks on this location. In General, traffic decreased over time, Traffic flow was greatest travelling towards the CBD. There are fluctuations over time, but at this stage I’m unable to assess whether these fluctuations are random, or whether they are a somewhat modulated/depressed traffic light fluctuations (or whether its somewhat in between). This might be clarified with further, more in depth analysis. This site was probably not an optimal site to sample, – I was trying to measure two different things and it was the wrong location for both of them. It would have been better to assess traffic flow between Blighs road and Harper ave ,either on Idris road or Fendalton ave. The optimal location to assess traffic flow to a hypothetical business hub at the Airport end of Wairakei road, would be in the portions of the road that intersects with either Grahams rd or Greers road. Overall,.. traffic flow seems to be greatest travelling from the north east to the south West. The most salient observation is that traffic density was highest on Harper ave, on the side of the road travelling away from the former CBD. What this study is unable to say is – where are those cars going to? One could hypothesise that many businesses may have relocated to industrial areas on the south west of the City, south of Blenheim road, and between Moorehouse ave and Brougham street. * What? you think i’m randomly throwing in big statisticy jargony words in an effort to make it sound as if I know more than I really do?,… yeah nah,.. I wouldn’t do that,.. honest,.. well not much anyway…. i’m pretty sure data drilling has nothing to do with the type of road worky drilling that’s happening all over the city,… yep,.. the skin of Christchurch is being infested with a plague of burrowing parasites (which are actually helping the overall health of the host (ie. Christchurch),.. so by definition they can’t be parasites,.. rather it is delicate microsurgery,……that causes minor surface irritation. #Prior to the commencement of the study I had realised that it would be difficult to physically write each observation time down at the time of the actual study periods, so some form of electronic recording would be needed. Earlier I originally enrolled in general stats in first half, was going to study effects of the road works associated with turning the marshland rd round about into traffic lights on traffic flow through the intersection. In my original pilot study, for the earlier incarnation of this project, I used a sound recorder app on my start phone, and as each car passed I stated the number of passengers and. As part of this initial pilot study, I realised that there was practical difficulties with the exact type of data collected, and I would get far more salient data by comparing traffic the four arms of the intersection (with collection point effectively being a categorical variable, as well as the side of the road the car & whether it was going into the roundabout, or was coming out of the roundabout). Since in the pilot study I had made a sound recording, I decided that for cars going one way I’d tap the phone one way, and – thus when played back i’d be able to record when each tap was made by the sound clip time stamp, and would recognise from which direction the car travelled from by the type of tap. This study wasn’t completed, as I had to withdraw from that course. When planing my project for the second time around for this paper, the roadworks on the original intersection chosen had been completed, so a new study site was needed. I also realised that my original method of recording the passing of each car would require time consuming review of the sound recordings after each observation period, so searched for a smartphone app that could tally data counts, and would record a time stamp for each observation. Most importantly, it needed to be an app that allowed simultaneous recording of two variables. ** I found that if I was parked on the street where traffic flow was being recorded that the error rate was much lower, as the phone was physically oriented the same as the road (ie. for a car travelling on the left site (relative to the direction I was facing ) I tapped on the left, and the converse for the right side). The error rate was higher if my vantage point was down a side street (my brain evidently was occasionally confused about whether I should tap to the left for a car travelling from the left or too the left from time to time, – this no doubt reflects personal cognitive deficits related to spatial orientation (dyspraxia being a major contender for left-right cognitive errors). For one sampling period I did made a video recording that I could later review, so that error rate could be quantified, – however this recording was never reviewed because it was a “parked on the study street” study site, and I realised that recording error was likely only an issue for sites where the vantage point was down a side street (and all other subsequent vantage points were on the study roads). If I am able make baseline measurements after the road works are completed, I will video record traffic flow at one of the side street vantage point study sites so that I can quantify the error rate.